We’re thrilled to support the GitHub Checks API, which launches today. This is the first feature built specifically for repositories with our GitHub Apps integration enabled. It is available to private and open source projects using travis-ci.com. 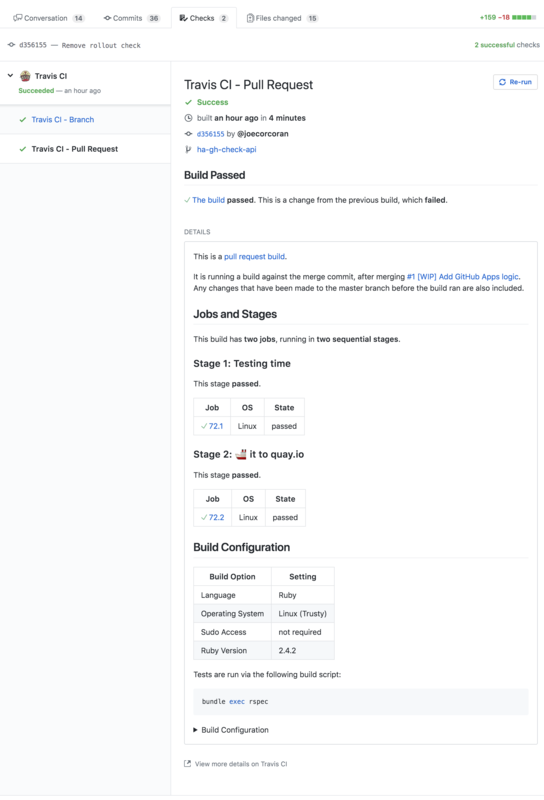 GitHub Checks API allows you to view build stages, jobs, and results, so you can get a complete picture of the health of your projects directly from GitHub. You can also see your config and re-run builds from within the GitHub Checks UI. GitHub Checks is the supercharged version of the GitHub Commit Status API. We’re excited to integrate with Checks to share more information about your build with you and your team from within GitHub. You will have more information about your code, from right where it lives. Projects using our GitHub Apps integration will have an additional “Checks” tab in a Pull Request where you will see Travis CI listed. The GitHub Checks page shows a detailed summary of your build and gives you the ability to re-run it directly from the GitHub Checks page. 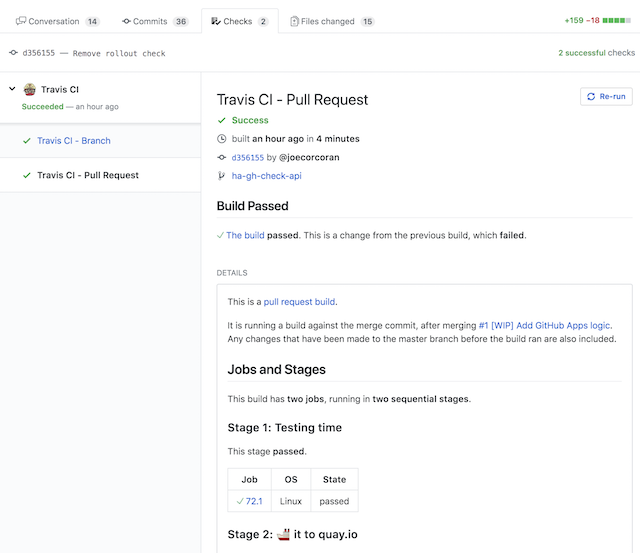 You will also see the new-style Travis CI build statuses when viewing a Pull Request on GitHub, which provides more information about how long a build took to complete from the Pull Request conversation page. Within the next two weeks, we will be disabling GitHub Commit Status API updates to commits for repositories using GitHub Apps. If you’re using protected branches, you will need to update your repository settings in GitHub to use the GitHub Checks API. Projects that are still using the Legacy Services Integration will continue to use the Commit Status updates. Since GitHub Checks requires GitHub Apps, we highly recommend you switch over to the new integration. Private projects on travis-ci.com can start using GitHub Apps clicking the “Activate and Migrate” button in the profile page. We also have a helpful guide on how to migrate your private projects from WebHooks to GitHub Apps. Open source projects on Travis CI will soon have the option to migrate over to travis-ci.com. We’ll do a wider announcement when this is ready. Read more about this in our docs. We’d love to hear your feedback and opinions on how our integration with the GitHub Checks API improves your workflow, and where you’d like to see us take the integration next. Please let us know at support@travis-ci.com – looking forward to hearing from you! To learn more about GitHub Checks, have a look at GitHub’s announcement. And, as always, many thanks and 💖s to the GitHub teams building Checks and supporting us with our integration.